Sub: Reduction in the residency period for promotion from Grade Pay Rs.1800/- (Level-1) to Grade Pay Rs.1900/- (Level-2). 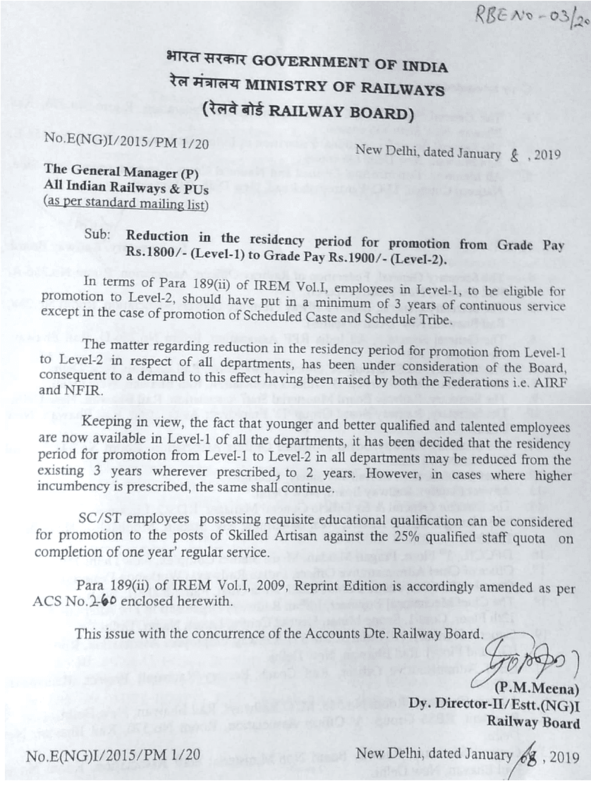 In terms of Para 189(ii) of IREM Vol.1, employees in Level-1, to be eligible for promotion to Level-2, should have put in a minimum of 3 years of continuous service except in the case of promotion of Scheduled Caste and Schedule Tribe. The matter regarding reduction in the residency period for promotion from Level-1 to Level-2 in respect of all departments, has been under consideration of the Board, consequent to a demand to this effect having been raised by both the Federations i.e. AlRF and NFIR. Keeping in view, the fact that younger and better qualified and talented employees are now available in Level-1 of all the departments, it has been decided that the residency period for promotion from Level-1 to Level-2 in all departments may be reduced from the existing 3 years wherever prescribed, to 2 years. However, in cases where higher incumbency is prescribed, the same shall continue. SC/ST employees possessing requisite educational qualification can be considered for promotion to the posts of Skilled Artisan against the 25% qualified staff quota on completion of one year’ regular service. 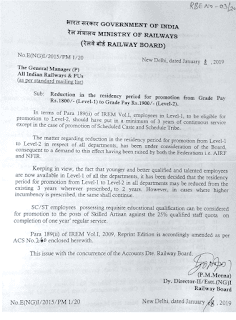 Para 189(ii) of IREM Vol.I, 2009, Reprint Edition is accordingly amended as per ACS No.260 is enclosed herewith. This issue with the concurrence of the Accounts Dte. Railway Board. it has been decided that the residency period for promotion from Level-1 to Level-2 in all departments may be reduced from the existing 3 years wherever prescribed, to 2 years.